Remember the physics demo that caused a brief shutdown of the Omaha, Neb., airport two weeks ago? The Transportation Security Administration has released a photo of the device which appears to be an experiment to simulate testing the oxygen saturation in a person's blood. 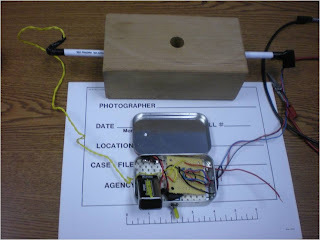 The TSA blog wrote a blog post intended to warn travelers that "homemade gadgets" can sometimes look a lot like an improvised explosive device to a TSA officer. "Let’s be clear, it was completely innocent. He had no way of knowing his improvised mint tin would look like an improvised explosive device (IED) on our X-ray monitor," the blog said of the student involved in the incident. The device in the photo above looks identical to one that won the second place prize in the American Association of Physics Teacher's 2011 Apparatus Competition. That device is a homemade pulse oximeter - a tool that measures the oxygen saturation in a person's blood without having to take a blood sample. A pulse oximeter has two different LEDs (one red and one infrared) that face a photo receptor. When worn on a finger, the receptor measures how much light coming from each LED is absorbed by both oxygenated and deoxygenated hemoglobin in the blood and calculates a ratio between the two. A normal range for healthy oxygen saturation is 95-100 percent. The physics apparatus works similarly, but instead of sampling a person's blood (via their finger), the LEDs measure the light absorbed by two different liquids. First, the experiment calls for a green LED to be shone through a small, clear container filled with a chemical indicator called bromothymol blue. The bromothymol blue represents oxygenated hemoglobin. A voltmeter or multimeter measures the change in intensity of the light. Then, another liquid, an acid solution representing deoxygenated hemoglobin, is measured. The bromothymol blue should absorb more of the green light than the acid solution. The test is repeated for both liquids using a red LED. The experiment mimics how a pulse oximeter measures the oxygen saturation in a person's blood. That device is a homemade Medical Device Company pulse oximeter - a tool that measures the oxygen saturation in a person's blood without having to take a blood sample. Wow! You have to be sooo careful these days. In their defense though, that photo DOES make it look like a bomb!